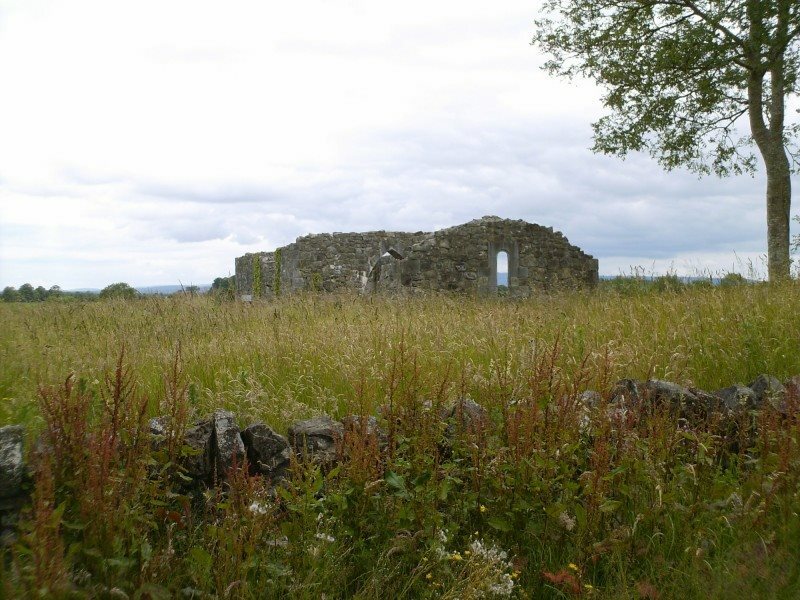 Today March 11th marks the death of Aengus the Culdee or Aengus Céilí Dé (Aengus the servant of God), who lived, studied and died right here in Co. Laois. Aengus was quiet a remarkable figure within the Early Christian Church in Ireland. He was born sometime in the mid-8th century A.D the son of Oengobhan, a King from the Dalriada, an area which included lands in Ulster and Western Scotland. The Culdees were reputed to be a reform movement of clergy within the early church whom practiced an austere, pious and solitarian style of religious worship. They were famed for the crafts and skills such as illuminated manuscripts and high cross sculptures. The Culdees were regarded as the servants of God, and Aengus was perhaps their best known and most revered personality. Aengus was clearly a learned man as evident from his later literary works. Perhaps as a son of a King he may have gone on to become a bard had he not chosen his life in devotion to God. He was also a man of great influence as we shall see in his dealings with Aed the King of Leinster. Some of the areas associated with Aengus in Co. Laois, Clonenagh, Dysert Enos and Coolbanagher. Aengus was firmly rooted in Co. Laois during his lifetime. He began his religious studies at the great monastic school of Clonenagh under the direction of its then abbot Malathgenius in the mid 750’s during a period in which Irish monks were at the forefront of Christian missionary work throughout Europe. 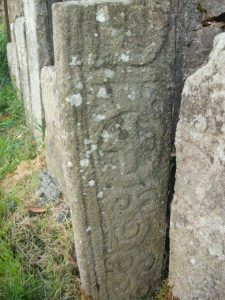 The reasons why he came to study at Clonenagh are unclear, but at that time the great monastic settlement was one of the foremost religious apprenticeship schools in Western Christendom, renown for teaching many European monks who came to study in this peaceful land, away from the turbulence of dark-ages Europe. Another likely explanation for choosing Clonenagh, may have been its links established under St. Fintan with the monastery in Dalriadan territory of Bangor in Co. Down. 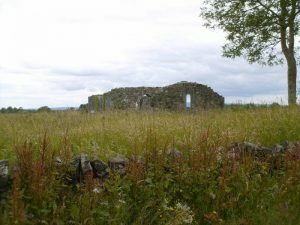 On completion of his studies here, it would appear Aengus joined the Culdee movement and in the fashion of that organization he established a hermitage at Dysart Enos (Hermitage of Aengus) just outside the town of Portlaoise in the hills visible to the east of Clonenagh approximately 15km away. It is at Dysart Enos, that Aengus is said to have become famed far and wide for his numerous miracles. These are recorded in his biography written almost a century afterwards. One such miracle says that whilst cutting a tree Aengus accidentally chopped his arm off, he then picked it up and reattached it to his torso and continued his work. Given his preference for solitude and his growing fame as a great healer, Aengus decided to up sticks and move to a quieter retreat away from the profane world. It seems he may have travelled to Ballingarry in Co. Limerick and founded another hermitage there which bears his name. 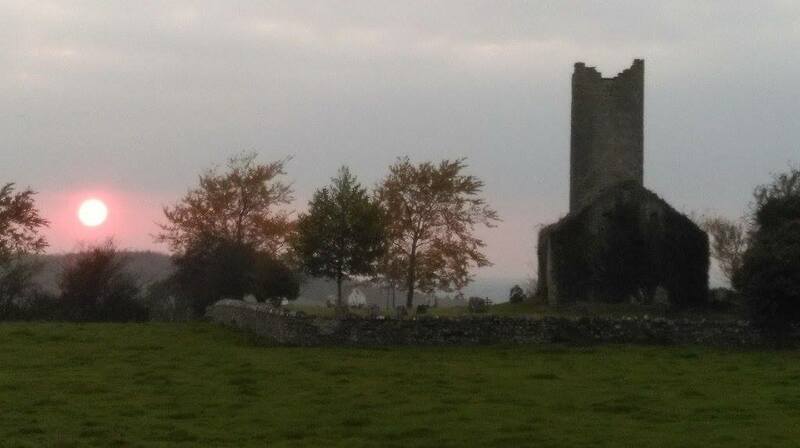 Dysert Enos “Aengus’s retreat” outside Portlaoise. From here he travelled back to Laois and seems to have founded another monastic site called Disertbeagh (precise location unknown) along the banks of the river Nore, close to its mother house at Clonenagh. 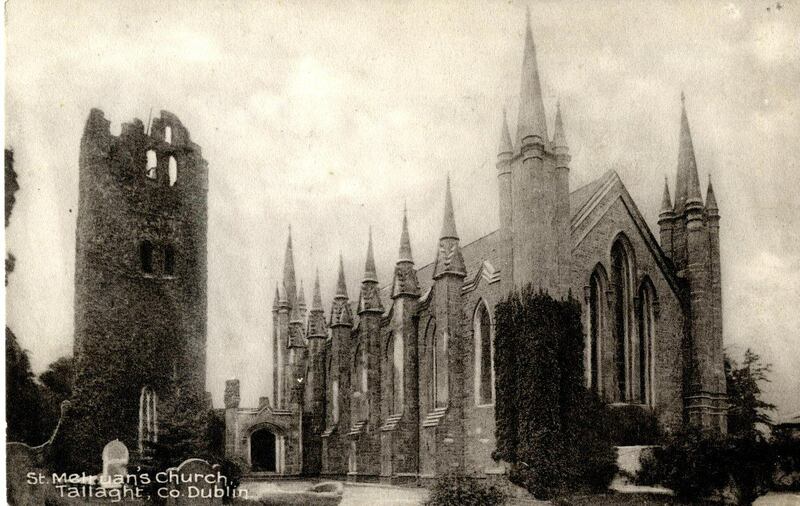 His mission continued and he travelled on to the new monastic foundation at Tallaght, founded by St. Maelruain in 769 A.D. Maelruain like Oengus was a prominent member within the Céilí Dé and Tallaght acted as the new HQ for this revolutionary religious movement of 8th Century Ireland. Whilst on his journey to Tallaght, Aengus had some unfinished business in Co. Laois. At Coolbanagher in the ancient territory of Maig Rechet near Emo another great miracle is said to have happened in the life of Aengus. A recent burial in the church grounds at Coolbanagher was seen by Aengus and when he approached it he looked up to see all the angels in heaven look down upon the priest who was interned in the grave. The angels indicated that this priest had begun to write a poem about all the great saints of the world and he had died before its completion. It is said that Aengus vowed to complete the divine work of this priest, beginning right away. And so it came to pass, the famous Martyrology of Aengus was begun, right here in Co. Laois, continued at Clonenagh and completed at the monastery at Tallaght. This was the first ever book which recorded the feast days of all the great saints in Ireland. Without its composition we would probably be unaware of the dates on which saints died and thus festivals such as St. Patrick ’s Day and St. Brigit’s Day along with all the other patron days of the saints would be unknown to us. 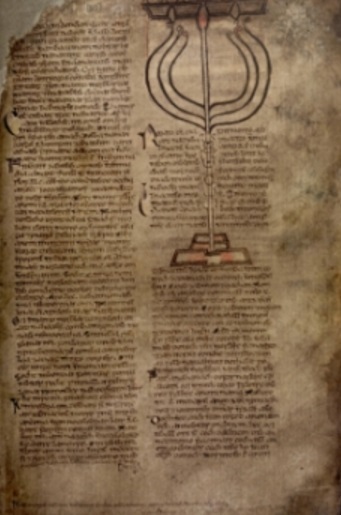 The Martyrology survives in 10 different manuscript copies, the earliest of which is to be found in the 15th Century Leabhar Breac. The Martyrology consisted of 365 quatrains for each day of the year and some days mention up to five feast for saints from Ireland and abroad. For instance an entry for Feb. 17th reads: “Everyone proclaims it as far as the Great Sea, the feast of Cormac the purely good, with the feast of Fintan the prayerful of vast Clonenagh”. The Martyrology also includes texts concerning religious practice and records events which occurred during its composition. One such piece read interestingly that “Tara’s might perished on the death of her Princess, with a multitude of venerable champions the great height of Armagh abides”, a clear reference to the stature of the new Christian order over the old pagan ways which were epitomized at Tara. The manuscript also mentions that the church gained its freedom from the secular kings in the 8th century. A deal was struck by the Céilí Dé and Aed (“the dignified”), King of Leinster. The deal allowed monks and religious people the option to opt out of any wars which were being frequently waged amongst the kingdoms in Ireland at the time. This was a new departure in that the religious were not now regarded as the subject of the king in the ways they had been in the preceding centuries. Aengus reminds us of this great deal which he undoubtedly helped to strike with King Aed Oirdnide; “The Church of the living God, leave to her what is hers, every free man, who is without monastic rule, without obedience, is allowed to go to the battle of Noble Aed son of Niall”. In later life Aengus is said to have let his hair grow long and refrained from washing, in a bid to outcast himself from worldly society and attain his solitude. He wished to devout himself entirely to pray and service to God alone. It is said in his 9th Century biography that he recited the whole psalter and genuflected 300 times daily. It seems that he was ordained a Bishop at some point after Tallaght, a rank in Early Medieval Ireland equivalent to a petty king according to the law tracts from the time. According to the Martyrology of Tallaght in which Aengus had helped to initiate, this greatest of church reformers passed away on a Friday, March 11th perhaps in the year 824 A.D. It seems he died at his hermitage at Disertbeagh on the banks of the Nore and his body was buried at Clonenagh in Co. Laois.